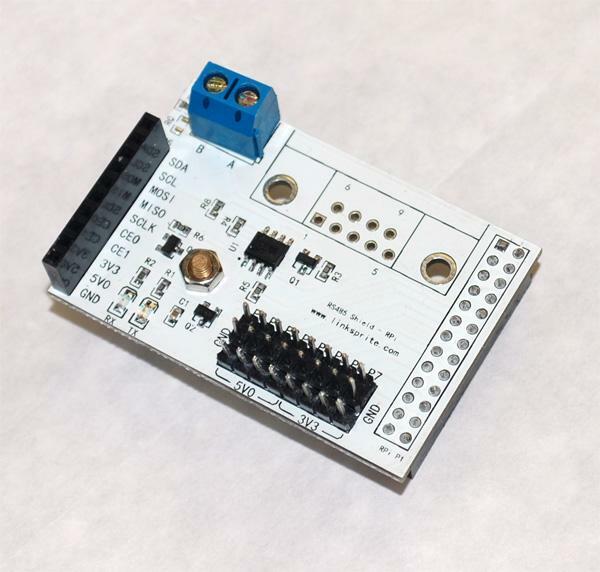 The Link Sprite RS485 GPIO Sheild for a Raspberry Pi alows you to make use of (abuse) the RS232 port in the R-Pi’s GPIO as an RS 485 Port. There are several good advantages to RS 485 over 232 and some awsome ones. RS485 is capable of both multidrop and very long cable legnths (even though the data rate can be a bit rubbish, and its normaly half duplex). I picked up my R-Pi LinkSprite RS434 shield from RoboSavvy (schematics). The plan is to use RS485 from a R-Pi to several Arduino nodes for my Boat Automation. The UART is /dev/ttyAMAO, it defaults to output system log. But since I want to use this UART to connect the RS485 board, I need to modify two files: /boot/cmdline.txt and /etc/inittab. Comment out the last line of /etc/inittab. To comment out, it simply addess a ‘#’. Save the changes, and reboot. the TX/RX pins with a baud rate of 115200.